Are you up for the challenge? 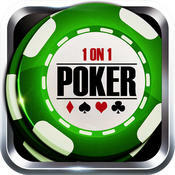 Do you have it in you to test out your poker skills 1-1 and bring out the real champion in you? 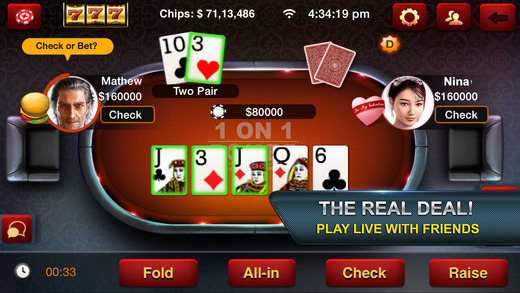 We bring you the most Authentic Poker experience on your mobile. Play 1-1 Poker against some of the best players across the world and prove your mettle. 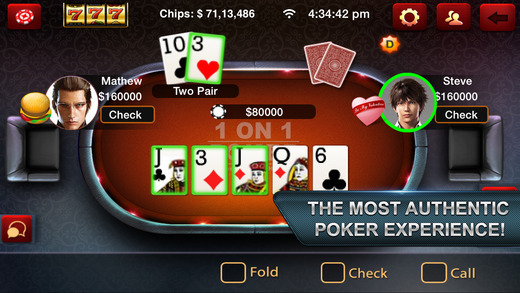 This is arguably the best FREE poker app for iOS. On Signup, get a bonus of $10,000 chips FREE. FREE Daily bonus which can be up to $100,000 chips. FREE weekend and special occasion bonus. FREE chips for inviting your friends. Slow, Medium and Fast tables to chose from. Play with Friends – Join any table with just a click. Invite Friends to join you on a table. Search your friends and add them as buddies on the go. Leader board to track the top 100 users. 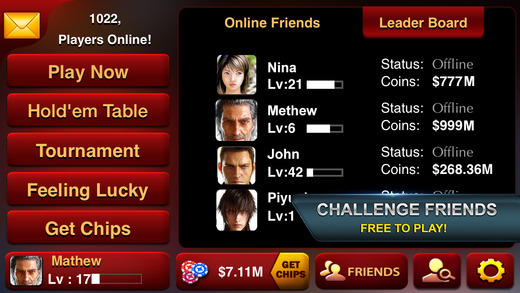 Chat – Interact with friends while playing the game. Smileys – Send smileys to show your emotions during a game. n-Game Virtual Gifts – Send a glass of beer or a pack of cigarette to your opponent [Many more gifts to chose from]. Statistics – Enhanced statistics to keep a track of how well you are doing. Mini Slot game to pass some time and to win big bucks while waiting for your opponent. Sign up using a Facebook account or using an email.